Having packed up all our things and set them out into the hall before bed the previous night, we awoke at around 8 or so and leisurely went for some breakfast in La Veranda. The emotions of every guest seemed to all be the same as there were more than a few tearful goodbyes exchanged between new friends. 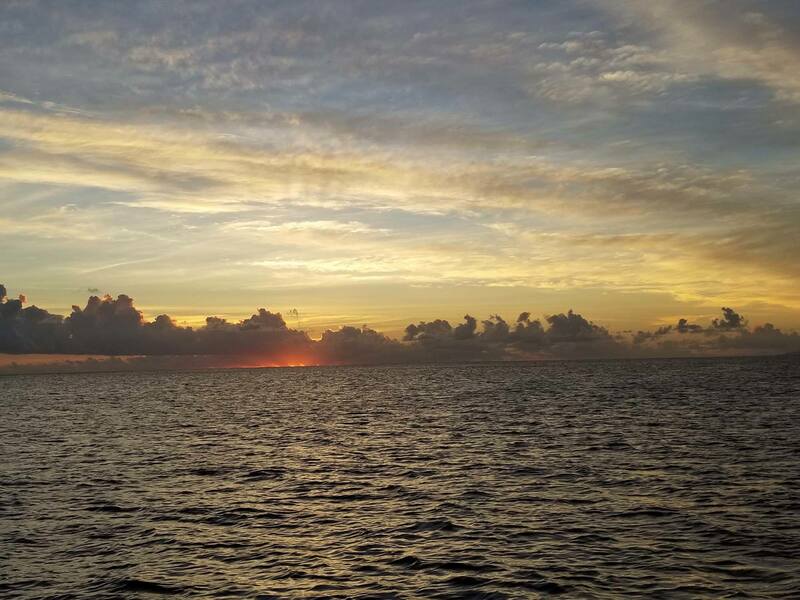 The crew continued to provide the best service as the last meal for this cruise was served. One of the best parts about cruising on a small ship like the Paul Gauguin is that you can really connect with fellow passengers and feel this incredible camaraderie as you share amazing experiences together. "Thank you Papeete. Thank you for your visit. Thank You"
After a last check of our stateroom and some more goodbyes to our new friends, we disembarked the cruise and headed to our hotel for the day. Being a remote island, Tahiti only has one or two flights to the USA each day. Our flight wasn’t scheduled to depart until 11:59 PM so we had the whole day to enjoy Tahiti and see the sites. First things first however, we had to check in to our hotel for the day. We had elected not to take the air inclusive program offered from Paul Gauguin Cruises that would have included day rooms and transfers on embarkation/disembarkation days. Instead we opted to try out a small motel called the Tahiti Airport Motel. I would not recommend you try what we did. The Motel is located on a very steep hill side and has the most ridiculous driveway you have ever seen. 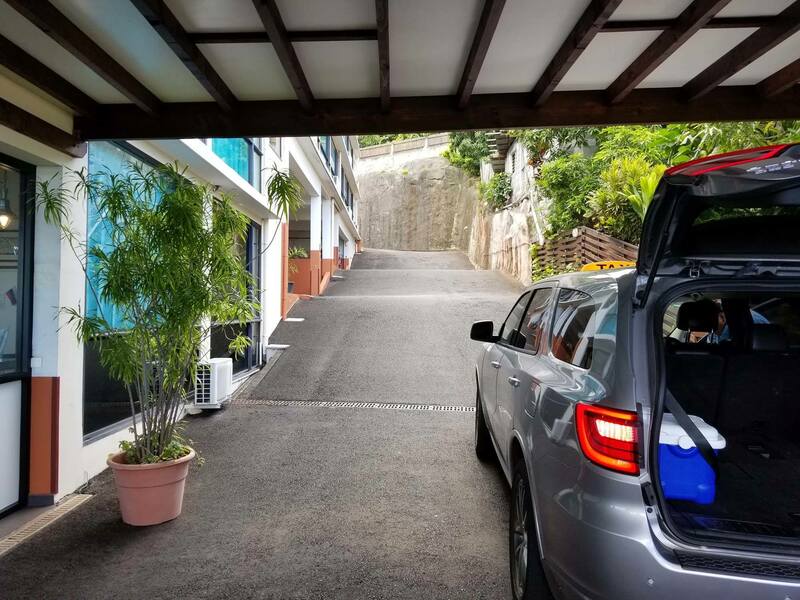 Sharp turns and steep inclines in the driveway make every taxi driver on the whole island charge you more each time they pick you up or drop you off there. We stored our bags at the motel when we arrived as we were told our room wouldn’t be ready until 1:00 PM at the earliest. 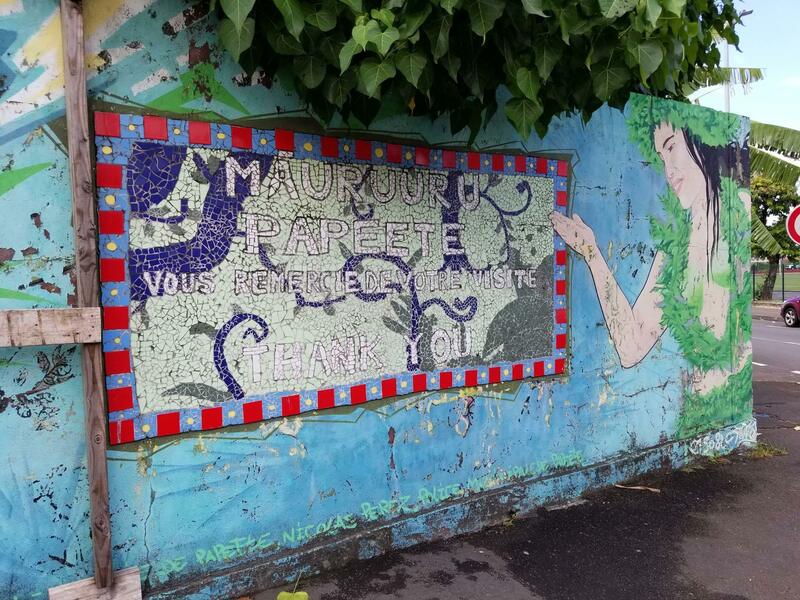 We decided to take advantage of the day and set out to do some shopping at the Marché de Papeete (Municipal Market of Papeete). We got to the downtown area by taking the pubic bus known around the island as Le Truck. Catching Le Truck is simple as you can generally flag one down when you see it and they will stop and pick you up. Be wary however, as they don’t operate on a very fixed schedule (more on that later). The fare was only 400 xpf (around $4 USD) per person, so it was much more budget friendly compared to taking a taxi. The market was hopping that morning as the vendors had their goods on display while out in front there was a local group of musicians playing guitars and ukuleles filling the air with music. 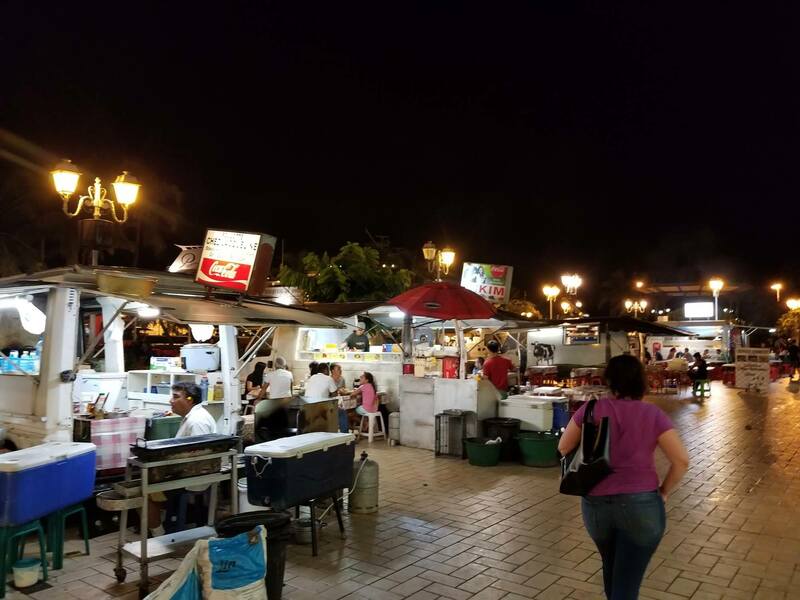 The market had some very distinct areas where you could find whatever it is you are seeking. 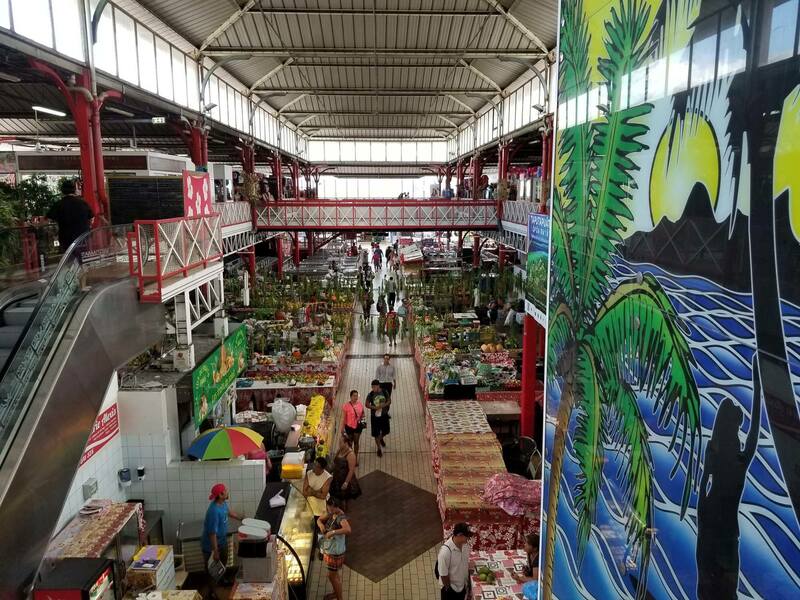 Whether that is floral arrangements, Tahitian styled dresses and shirts, locally made handicrafts and carvings, fresh fish and other delicious food stands, or even fine Tahitian black pearl jewelry, you can find a great deal of variety throughout the two levels of the market. My wife and I wound up purchasing two mother of pearl shells that had some lovely carvings on the inside. After our morning shopping, it was time to head back to the motel to meet our tour guide on the road between the motel and the airport (because the driveway, as mentioned before is ridiculous). We started to walk from downtown in the direction of the motel along the seafront. 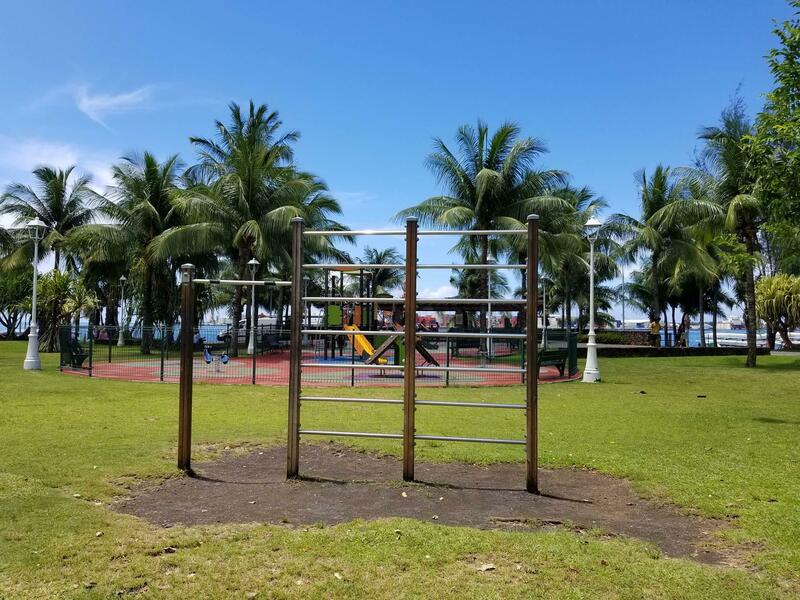 The seafront parks are perfect for a relaxing day for all ages with some playgrounds, local art sculptures, historical landmarks and beautiful flowers and trees throughout. If we’d had more time in the city or perhaps when we return with our son, some time to enjoy the park a bit more is definitely in order. Our march continued as we tried to find a bus heading our way to take us the rest of the way out to the airport motel. We saw several buses heading into the city but it wasn’t until we had walked a good 3 miles or so that we finally were able to flag one down headed our way. We rode the bus for about 4 blocks until we were at our stop and got off. By the time we reached the motel it was time to meet our tour guide for our trip along the west coast of Tahiti. In hindsight, we should have taken a taxi, but lesson learned. Our tour with Unique Tahiti was lead by Dominique that day. Interestingly enough, Dominique used to be the dive master aboard the Paul Gauguin until around 2010. 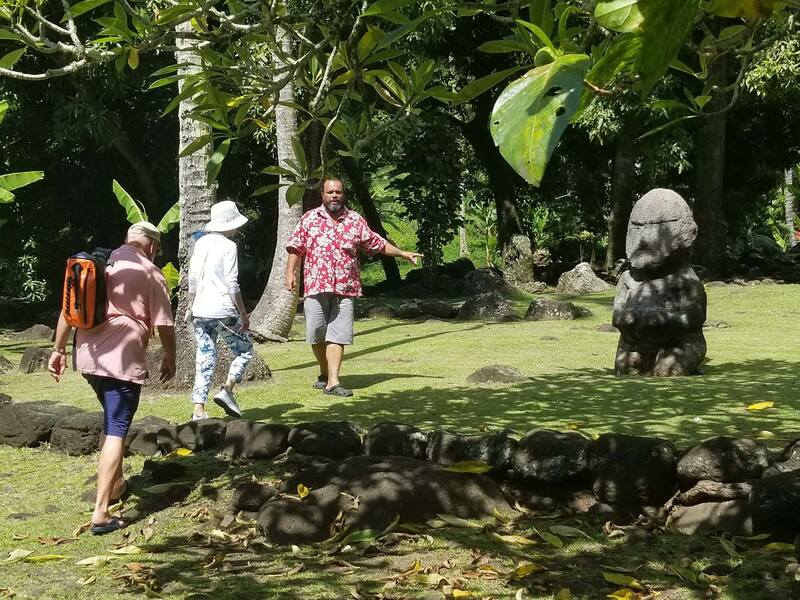 Our tour set off as we picked up some other guests at Le Meridian Resort and headed out to our first stop, the Marae of Arahurahu, an archaeological site of an ancient temple. There we learned about the various religious rituals and rites of the original inhabitants of Tahiti before Europeans ever landed in what is now the capital of French Polynesia. Our guide also pointed out the various plants and how they were (and in many cases still are) used in everyday life. Next on our tour we visited the stunning fern Caves of Maraa. These beautiful caves are fed by the rain water filtering through the limestone. 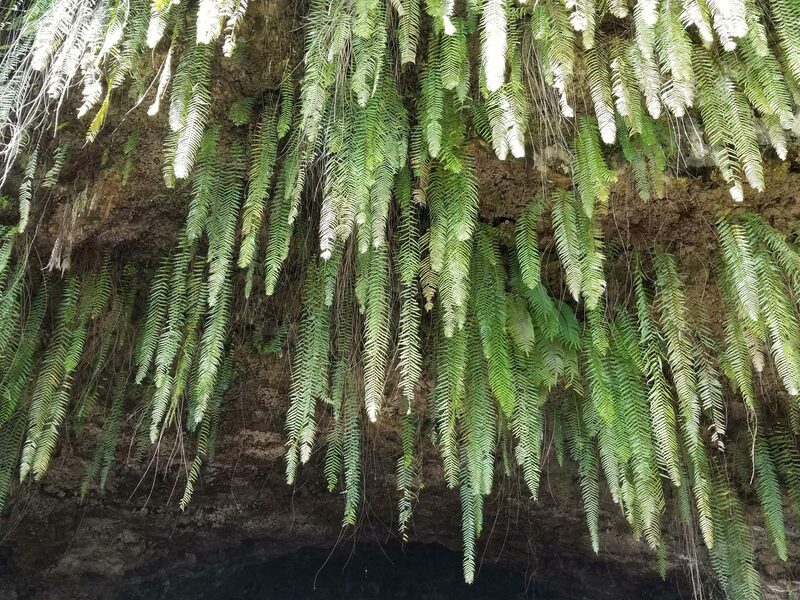 The ferns that cover the mountain side above actually grow down from the mountain at the entrance to the cave and give it this mysterious look. We found some local kids enjoying the afternoon and cooling off in the fresh water to escape the warm afternoon sun. There are a few caves at this site and even a nice little waterfall. Our guide showed us some more useful plants and even harvested some local nuts for us to try out. This is one location where there is natural spring water flowing and many locals gather by the road where the water leads to fill bottles of water. The water is super clear and safe to drink. Our third stop was at a black sand beach where we could take in some fantastic views of Tahiti Iti in the distance over the surf. The beach wasn’t very crowded though there were plenty of surfers out enjoying the waves. 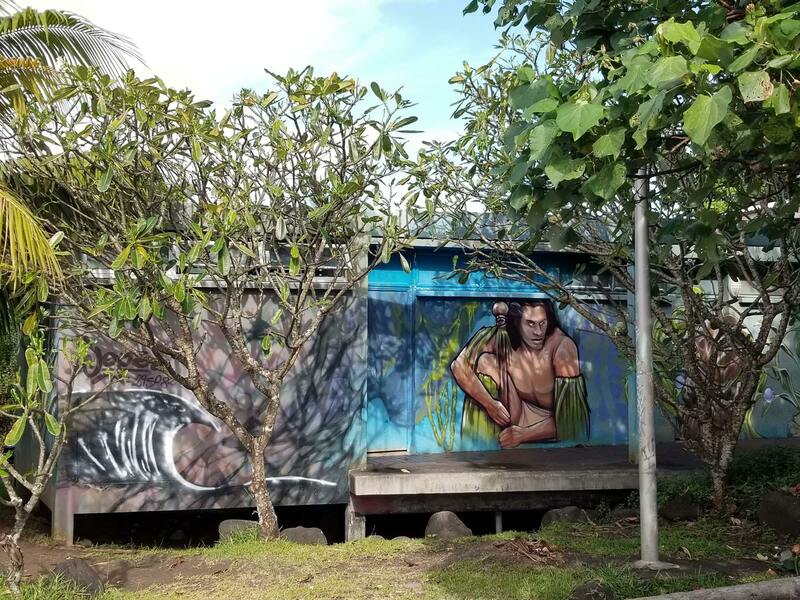 Throughout the island and even at this beach park, the government has asked graffiti artists to decorate the walls and structures on the island and the pavilion at this beach was gorgeous. There were beautiful murals painted on all sides of local Tahitians, sea animals, and important flowers all in vivid colors. 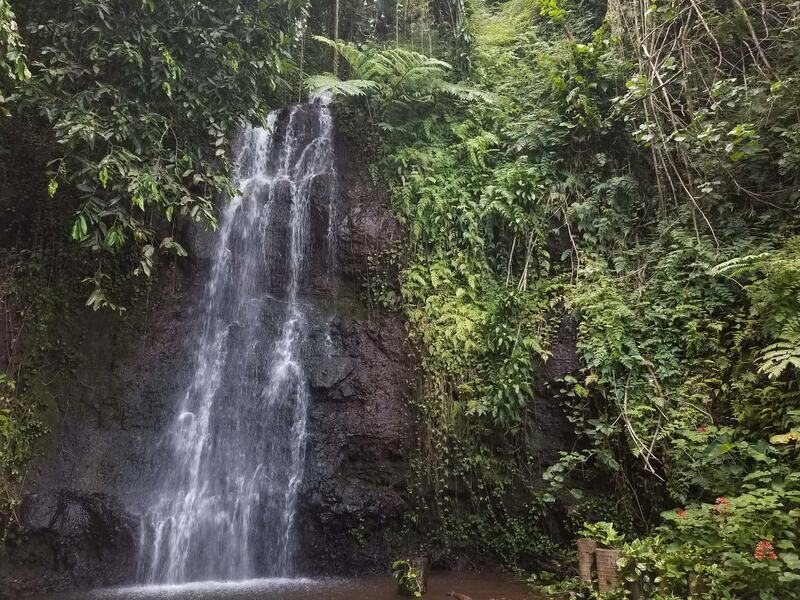 Our final stop was at the Vaipahi Botanical Gardens and Waterfalls. 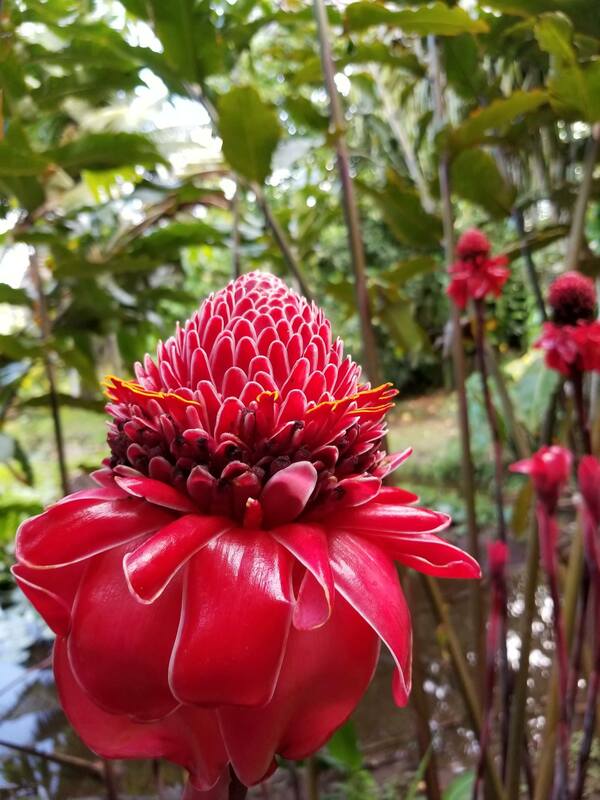 This beautiful garden includes signs (in Tahitian, French, and English) of each plant found there, and its uses to the people of the islands. There are some places in the garden where religious rites used to be performed and visitors can learn about the various stages of burial of prominent figures that took place there in the pre-European times. The garden is a very peaceful retreat and worth the drive from the hustle and bustle of Pape'ete. Our tour concluded after we paid the guide (cash only, no cards accepted for this tour unless otherwise prepaid) and were dropped off where we had been picked up 4 hours before. We trudged our way back up the hill to the reception desk and finally checked-in to our room. It was 6:00 PM so we had some time to kill until we had to go to the airport for our flight. After getting cleaned up we decided to hail a cab and visit the Roulottes or food truck park in Pape'ete. There were a variety of choices, but I decided to try some Asian food a try while my wife opted for a steak and some fries. The portions were massive at either place and the food was super yummy. After our dinner we finally headed to the airport in plenty of time to catch our flight back home. It was an incredible time and I hope you someday have the opportunity to experience Paul Gauguin Cruises and French Polynesia. The people were all very friendly both on and off the ship and the places we visited were nothing short of spectacular in their natural beauty. Sun setting over Bora Bora... still the most beautiful place in the world. Be sure to read the other chapters in our voyage. Have any favorite memories of the Cook Islands, Tahiti, French Polynesia, or Paul Gauguin Cruises? Leave a comment and share your story. 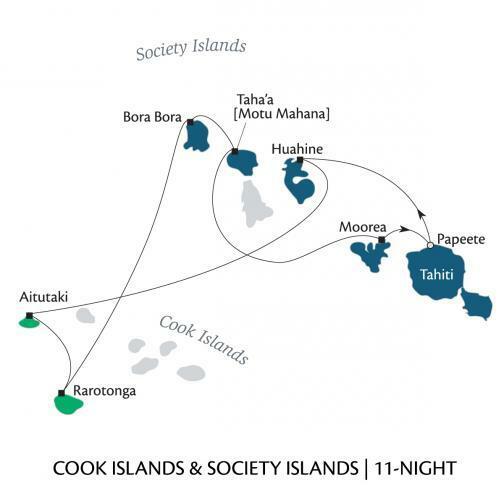 If you would like some additional information, or to reserve your trip to the Cook Islands or French Polynesia, contact us here.